I had this dream one night. In the dream, I was in my twenties. I was living with my parents in New Jersey, in the house where I grew up. Since my career had apparently stalled, a faceless, intimidating authority figure strongly recommended that I re-enroll in high school, to ‘get back to basics’ or something like that. Good news: you’ve already graduated! The thought of re-enrolling filled me with dread, but I did it anyway. I didn’t think I had a choice. For weeks, I struggled to re-learn my old routines, fumbling through locker combinations, math tests, and the like. I felt my spirit deadening with each passing day. I had my whole life ahead of me, so why was I going backward? It was so absurd, I started laughing … the kind of loose, wild laugh that comes out when you realize that you’ve been imagining those prison bars around you, that they were never really there at all. I had choices. I had options. And I didn’t have to stay at that school one minute more. I woke up with my hand on the double doors. I awoke the next morning with a sense of liberation singing in my veins. It was the kind of dream that’s more than a dream; that is, the kind that is trying to tell you something powerful about your waking life. So many of us walk around believing that we’re trapped in our own lives. We make a soul-deadening decision because some dictatorial figure — real or imagined — told us that that it was ‘necessary.’ We don’t think we deserve to be free, so we bind ourselves. We don’t give ourselves permission to get out of a bad situation, to take care of our hearts, to do anything but re-enroll in high school. But then, if we’re lucky, we find another way. We have a moment of illumination, or we meet people who give us the permission we can’t seem to give ourselves. 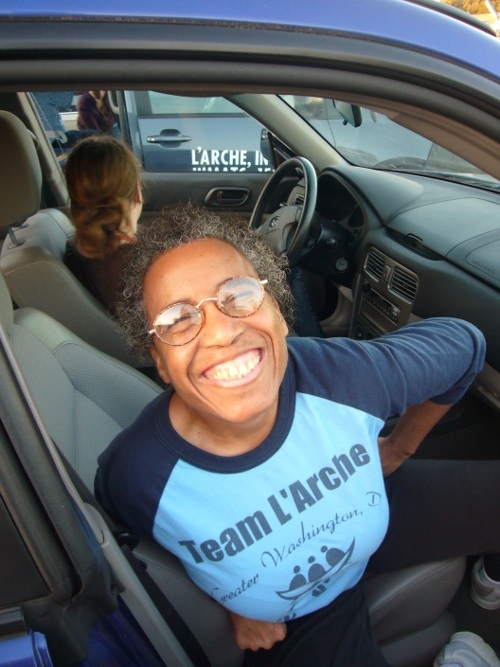 I think of how a long-term member of the L’Arche DC community came to work with the community full-time. Once upon a time, he’d been a lawyer, wearing nice suits, meeting with powerful people and enjoying a great deal of prestige. He wasn’t entirely fulfilled by his law work — in fact, he longed to do something else — but the validation he received from just about everyone in his life kept him bound to that career. That is, until he started hanging out at L’Arche … and specifically, spending time with Theresa** and her housemates (who, years later, later became my housemates). After a while, he realized that Theresa was perhaps the one person in his life who didn’t care one bit about all the ‘important’ things he did all day. Sure, she understood that he had a job; she just didn’t conflate who he was with what he did for a living. She didn’t treat him differently because he was an ‘important’ lawyer. Instead, what mattered to her was that he showed up. What mattered to her was that he was a friend. And what mattered to her, as it turns out, was what mattered to him as well. Just by being herself, she gave him permission to change his life. And so he took a leap of faith and went to work for L’Arche full-time. And who knows? 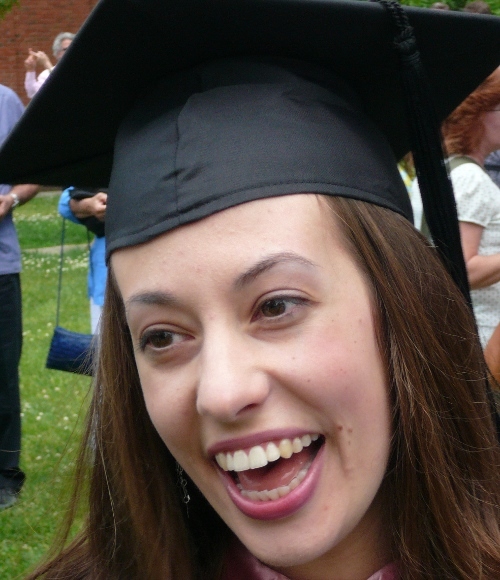 Perhaps the ripple effects of that choice are part of how I ended up at L’Arche years later. As Madeleine L’Engle writes, The pattern is closely woven. And so today, I challenge you to look — really look — at an area of your life in which you feel trapped or helpless. 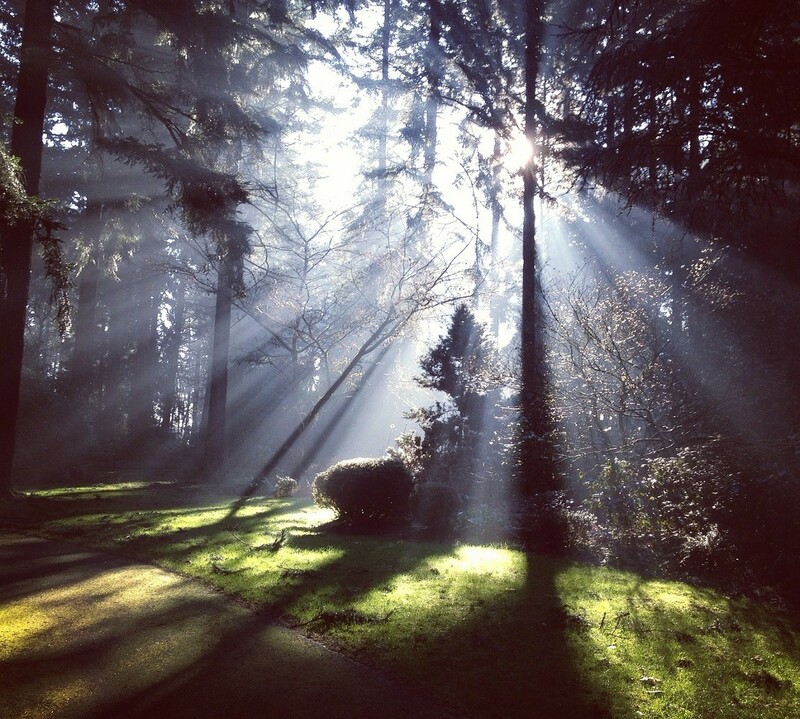 Then, identify a step you could take that would move you toward a place of freedom and spaciousness. And now, I’m off to take my own advice. There’s an email I’ve been putting off for some time, probably because I need to apologize. Today, that email’s getting sent. That’s what will bring me closer to the double doors. What’s your story of being set free? Join the conversation in the comments! Enjoy this post? 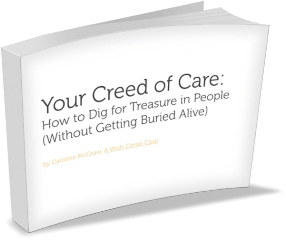 Receive posts via email, along with your FREE copy of Your Creed of Care: How To Dig For Treasure In People (Without Getting Buried Alive). *L’Arche (French for ‘The Ark’) is a faith-based non-profit that creates homes where people with and without intellectual disabilities share life together. In honor of my best friend Brooke’s blog launch (check her out at Books Distilled: Helping You Discover Books You’ll Love! ), today’s story is about…my best friend, Brooke. Brooke and I met when we were freshmen at Vassar College, but we didn’t get to be close friends until sophomore year. We bonded over books, editing each others’ papers and encouraging one another to keep writing. Everything was going along swimmingly…until a pattern started to establish itself. As the friendship grew, one person started consistently showing up late. I’m sorry to say that the person was me. I was late for coffees, editing sessions, and, one fateful day, late for lunch. Of course, I always had a ‘good reason’. There was always an excuse for me to be late. And I was never late by ‘a lot’, so, I reasoned, it wasn’t a big deal. I had a (self-imposed) punctuality disability. I pretended to myself that I was incapable of showing up on time…and I had no clue how this lie was affecting my friendships. But on the day I was late for lunch, something changed. I met Brooke on the steps of ACDC (the All Campus Dining Center), panting some lame excuse for being fifteen minutes late. And here’s the beautiful thing: she got mad. Constructively, truly mad. I saw frustration, disappointment and anger flash across her face…and then I saw her contain and utilize that anger, using it to fuel her truth. What did she do? She told me, gently but frankly, how my behavior affected her. She told me the truth about how my tardiness was impacting our friendship. Do you have a friend whose behavior is negatively affecting you? (Are they always late, constantly gossiping or forgetting to pay you back?) What would it take for you to tell that person your truth? A true friend will call you out when you’re treating her poorly. And she’ll do it in a way that draws you toward positive change. Hearing Brooke’s words felt like swallowing medicine…the kind that tastes horrible, but helps immensely. Is there a pattern of behavior in your life that negatively affects others? What would it take to change that pattern? But what helped me the most then (and what helps me most now) is this: I never want to see that look on a friend’s face again. I never want to make someone I love feel disrespected and devalued. Today, I perceive my desire to avoid that result as a strength…a strength I rely on to make sure I’m not late. Brooke’s one-time truth-telling has saved me a lot of heartache and hurt feelings over the years. What if she’d stuffed her feelings, and never owned up to that anger? I might still be stuck in tardiness…and we might not be friends. Fortunately, Brooke made the effort and told her truth, confronting me with love. Why? Because she wanted better for our friendship. Yes, I’m tempted to slack on punctuality sometimes. And, inevitably, mistakes happen. (Recently, I was late to a friends’ house because I had a bad set of directions and got lost.) But thanks to Brooke, my past tardiness doesn’t become a present-day pattern. I refuse to let it. Has someone else’s anger ever helped you to change for the better? If so, tell me in the comments! Furthermore, until the day that Brooke got mad, I didn’t see how owning my anger could be a catalyst for positive change within a friendship. Since then, I’ve come to believe that such truth-telling is not only possible, but essential. I’ve come to see that if friends can’t tell the truth of what they’re feeling toward each other– even when the truths are uncomfortable and difficult to face– then that friendship is on shaky ground. As such, I think back to that day when Brooke got mad as not only the day I ‘got’ punctuality, but as the day our friendship found itself on solid, lasting ground.